From a Pioneer press release: Brandon Reimers and Alex Wilga will serve as drum majors for the Pionner's 45th season of competition. The "Irish corps" is firmly committed to the overall development of its members on a variety of levels, including the development of important individual leadership traits and principles. Corps director Bobby Lindsey said, "After completing a rigorous assessment phase and our "drum major trials" component, Brandon and Alex emerged successfully from a strong list of veteran candidates. Beyond their musical and leadership talents and strengths, they both understand the importance and value of our corps traditions and our organizational commitment to provide every member a positive, "total experience" within the corps activity. Pioneer is a very unique corps that exists solely for the benefit of its membership. Our members always come first in our decision and planning processes. Both Brandon and Alex understand this, and they've taken on an important responsibility to serve our members, and our organization as a whole, in maintaining our solid reputation as a corps of class, and an organization truly committed to the youth of our activity." Brandon Reimers, 20, from Muscatine, Iowa, is a third-year veteran of Pioneer, spending his first two seasons as a member of the front ensemble. Reimers' main objective for the 2005 corps is to keep the strong traditions that have kept the Pioneer organization alive for nearly five decades. "It's my personal goal for the 2005 season, to share my talents with not only the members, but with every person involved with the Pioneer organization. As I venture on, I hope that I've been able to touch everyone in some way, to make each individual strive to become better every day!" Reimers said. Alex Wilga, age 19, is the son of Hank and Renee Wilga, and hails from Troy, Mo., where he attended Troy Buchanan High School. He is currently a freshman music education major at VanderCook College of Music in Chicago. 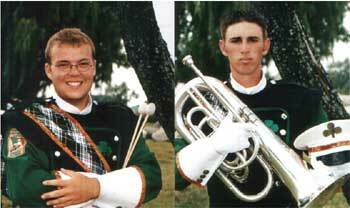 Wilga marched the 2003/2004 seasons with Pioneer in the horn line, and served as baritone/euphonium section leader in 2004. He hopes to not only lead the corps effectively this season, but also to share his passion for music, Pioneer, and the corps activity in general with his fellow corpsmates.